Psychics use a wide range of different techniques to help their clients get some insight into the spiritual world and get their questions answered. From tarot decks, to palm readings, to using their own intuition, and so much more, psychics have a lot of different tools in their arsenal. One of the things that certain psychics will rely on to deliver insight to their clients has less to do with spiritual communication and more to do with their own perception of a person’s reactions and their mastery of vague statements. These are called cold readings. Shotgun statements rely a lot on general information so that something is bound to be relevant to their client’s life. These statements get their name because a shotgun fires a ton of pellets rather than a single projectile. The point is that something is bound to hit the target. Barnum statements are named for PT Barnum, and these statements appear to be personal but actually apply to a large number of people. These rely on the phenomenon of people looking to believe what you’re saying and filling in the blanks of information for you. These statements work the same way horoscopes do. The readers are eager to believe them, and therefore they search for traits in themselves and recent events in their lives to make the reading relevant to them. The difference between a horoscope and a typical cold reading is that there is feedback involved in the latter. The psychic can use that interaction to gauge where they should go next based on their subject’s reaction. Again, these statements are very broad and can typically be applied to anyone. They usually are extremely open-ended, and you can then narrow down the field from there based on the subject’s feedback to be more accurate. This technique refers to when a psychic uses information that the subject has already revealed during the reading and recycles it in later predictions. If the psychic has already started speaking to their subject, they can use a few Barnum statements to get started and listen to what they say in return. They are likely to mention a few concrete things, or you might be able to infer something from what they say. In this technique, the psychic won’t acknowledge what they say but instead file the information for later on in the reading. When the time comes, they will pull out that information and watch the subject be shocked by the personal touch to the reading and enthralled by the “power” of the psychic. Most people who go to see a psychic are there because they want to be there. Most of us don’t have an annual psychic checkup that we dread going to the way we dread going to the doctor or the dentist. For this reason, most subjects are very cooperative, and it can be easy to get them to play along. That’s why some psychics use their people skills in this technique to encourage subjects to reveal important information about their lives. A psychic will begin using this technique by explaining that initial messages they receive through their spiritual connection might be vague, but with help from the subject, they can understand together why they are important. If the client agrees to this, then they know they have a cooperative subject. In a session like this, by the time it is over, the client has been the one doing most of the work. This works so often because clients are so ready to believe that they don’t realize they’ve answered most of the questions for themselves. Sometimes a psychic will make a vague statement that still misses the mark. When this happens, they use backtracking methods to make up for the error they have made. If a psychic claims they are speaking to a client’s aunt, only to learn that she is still alive, then they can correct themselves by saying that it must be someone who knew her aunt well or had a relationship with her. If a psychic just told their subject they are going to make a huge life decision, only to learn that this isn’t the case, then they can correct themselves by saying that it looks like they made a significant decision earlier in the year, or that their life will be undergoing some changes soon. By keeping things vague and telling the client that the spirit world isn’t very clear in their communications, a psychic can seem like they know what they’re talking about even as they are making it up as they go along. Having a subject you’re working on in person is very helpful for psychics using cold reading techniques. They can read the reactions on the subject as they go, and subtle reactions can sometimes reveal major details. This is why you often see psychics talking slowly. It’s not just because the cell signal between our world and the afterlife is a little spotty – whenever they make a statement, they’re looking to see how their subject responds. Even if someone is not speaking at the time, a lot of the psychic’s act depends on the subject revealing things that correct the psychic as they speak (“No, I think you’re talking about my sister, not my cousin”). These verbal cues or shifts in facial expressions, body language, and other subtle reactions tip off the psychic as to whether or not they’re on the right track. For example, if a psychic says something during a reading that makes sense to the subject, they might smile or nod. Being the subject of a reading is sort of like listening to a joke, waiting for the punchline. When the psychic says the thing that the client is waiting for, the client will react – and that’s what the psychic will pick up on to help further their reading along. Many people share information about themselves in a variety of ways – that often don’t involve them uttering a single word. For example, a wedding ring reveals that a person is in a committed relationship and has the life experience of a person in a marriage. Leaning in close during a reading reveals that you are eager to believe what the psychic has to say. 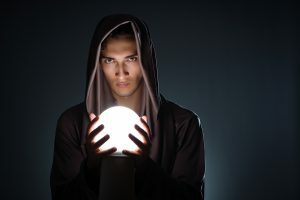 Psychics using cold reading techniques have trained themselves to spot a lot of these clues very quickly and use them when reading their subject. You can learn much about a person by paying attention to their behavior, clothing, speech patterns, and more. Psychics just do it better than most of us, but with practice, it’s a skill anyone can pick up! A lot of psychics learn everything they need to know about their subject before the reading even begins. If a psychic is working with an audience or simply a large group of people, then this becomes even easier. 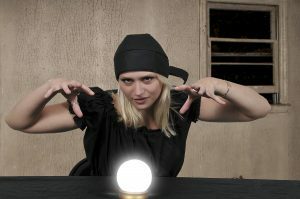 Many psychics use the simple trick of picking their subject ahead of time by spotting the person they want to focus on. From there, they are provided with plenty of time to search for clues to help them get a handle on who they are dealing with. In many cases, they are even able to get a conversation started between them and someone else in the audience. By listening in on this conversation, they can gather a lot of information and use it to their advantage when the reading comes around. If a psychic is planning on giving a demonstration, they often pick their subject before they even mention their “psychic” abilities. In fact, in today’s day and age, they can often get the subject’s name and then check their social media accounts using their phone to learn a lot of information about the person before the subject even knows they will be getting a reading. In a lot of cases, therefore, this means that psychics often are just really good Googlers – or you could call it stalking! But either way, it gets the job done.